Portable and high-speed file transfers. Transfer, save and protect your photos, videos, music and other massive files to free up valuable space on your computers. 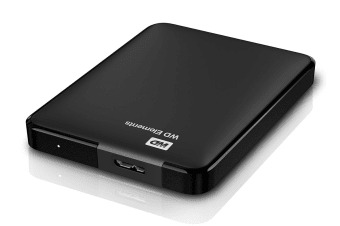 Featuring blazing-fast transfer speeds, 3.0 and 2.0 USB computability, the WD Elements 4TB USB 3.0 High-Capacity Portable Hard Drive is the ultimate storage solution offering the capacity and security you need. WD Elements portable storage comes with a trial version of WD SmartWare Pro backup software, which allows you to back up your files to you WD Elements drive or to the cloud using your DropBox™ account. When your internal drive is almost full, your PC slows down. Don't delete files. Free up space on your internal hard drive by transferring files to your WD Elements portable storage and get your laptop moving again.